MacKaye immediately set about promoting his idea within his network of friends and colleagues in Washington, New York, and Boston, but it was again hikers who took up the cause—newspaper columnist Raymond Torrey in New York especially, who led a small crew building the first A.T.-specific miles in Harriman–Bear Mountain State Park under the aegis of Maj. William A. Welch, who soon shifted the goal to “Maine to Georgia” and designed the iconic diamond Trail marker. Emile Benton MacKaye was born on March 6, 1879, the fifth of six children, to a family deeply burdened with financial troubles. It was months before they named their newborn son, who was referred to in the interim as “Little Mr. Nemo.” When he was finally given a name, it was derived from his paternal grandmother’s name, Emily Benton Steele. His father, Steele MacKaye, was a struggling playwright in New York, and his mother, Mary, stayed at home in Stamford, although she was also occasionally involved in theatre (Anderson, 2002). MacKaye’s childhood was plagued with a succession of moves, as his father continued to squander whatever earnings he made in the theatre. Finally, his brother William, the second oldest, obtained a modest family estate in the small village of Shirley Center, Massachusetts. In July of 1888, the eight-year-old MacKaye moved with his family into “The Cottage,” as they came to call it. He was immediately enamored with the beauty and freedom of the country and proclaimed he enjoyed it far more than urban existence. Tragically, William died the following winter of a respiratory disease, but the family cherished his legacy. The Shirley Cottage would become MacKaye’s true home for the remainder of his long life (Anderson, 2002). It may be impossible to pinpoint the first person to propose the Pacific Crest Trail but published accounts tend to acknowledge the following people: Catherine Montgomeryat the State Normal School in Bellingham, Wash.; a former Supervisor of Recreation for the U.S. Forest Service, Fred W. Cleator; and Clinton C. Clarke of Pasadena, Calif. According to author and mountaineer Joseph T. Hazard, Catherine Montgomery suggested the idea of a border-to-border trail to him in 1926. Fred. W. Cleator, who oversaw the Pacific Northwest Region of the Forest Service, outlined Oregon’s Skyline Trail (a seminal link of the PCT) in 1920 and extended that trail to Oregon’s north and south borders. Cleator also initiated plans for a similar trail in Washington. Clinton C. Clarke, founder of the Pasadena Playhouse and chairman of the Mountain League of Los Angeles, however, is often called the “father” of the PCT because he organized the Pacific Crest Trail System Conference in 1932 to promote the concept of a border-to-border trail. 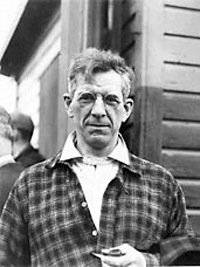 Under Clarke’s inspiration, the Pacific Crest Trail System Conference (a federation of hiking clubs and youth groups) devoted itself to developing an interconnected system of existing trails and new trails that would extend all the way from Canada to Mexico on or close to the crest of the mountainous western states. This was not a new idea, but unifying the many hiking groups for this cause was. Members of the conference included the Boy Scouts, YMCA, Sierra Club, Los Angeles County Department of Recreation, California Alpine Club, Mazamas of Portland, Mountaineers of Seattle, Federation of Western Outdoor Clubs, and the Shasta-Cascade Wonderland Associations. Clark served as president of the conference for 25 years. Renowned nature photographer Ansel Adams was a member of the executive committee. At the time, six segments of the system were already complete (the Cascade Crest Trail in Washington; Oregon Skyline Trail in Oregon; Lava Crest Trail in northern California; Tahoe-Yosemite Trail in California; John Muir Trail in California; and the Desert Crest Trail in southern California) and Clarke recruited Civilian Conservation Corps (CCC) members to help plan and build remaining trail links, bridges, and structures.